Each month, our entire staff pitches in to prepare the “sacks,” which include a drink, PB&J sandwich, chips, crackers, fruit snacks and another snack chosen by the staff. The sacks are filled on Thursday and taken to the Shelter on Friday. As those of you in the Midwest will remember, the beginning of January 2018 was extremely cold. We knew that just lunches were not going to cut it! 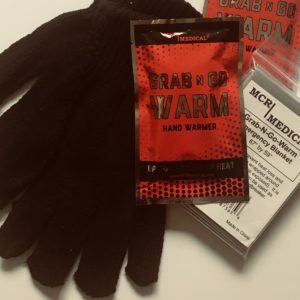 As well as adding our own Grab-N-Go Hand Warmers, Grab-N-Go Dry Emergency Rain Ponchos and Grab-N-Go Warm Emergency Blankets to the care packages, our staff worked for hours to find a company that could overnight 200 pairs of gloves. What an opportunity to be able to meet an immediate need! Extra goodies to warm bodies and lift spirits. 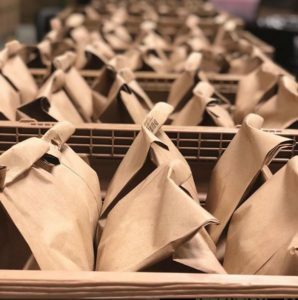 Of course, helping others through projects like the sack lunches provides our staff with a sense of purpose – a chance to step back from our daily routine and appreciate how fortunate we truly are. But there’s a special part of our workforce that we are blessed to share this opportunity with. These employees – called our “crew” – are part-timers hired through Viaquest (a non-profit aiding veterans and those with developmental disabilities through specialized services). These wonderful folks assist in our warehouse with inventory, repackaging, and labeling. They attend all of our team building activities (everything from bowling to historical tours of the Columbus area). But preparing the sack lunches for The Open Shelter is by far one of their favorite team tasks. How lucky we are, not just to share our own time, treasure and talents, but to provide others with the chance to experience the joy of giving back as well? So where do you make a difference in YOUR community? Tell us your story in the comments. When we each do a little, we all do a lot. And- fair or not – we get back what we give, and then some. NOTE: If you’d like to learn more about The Open Shelter or Viaquest, click on the links below!